Click here for requirements and to download the nomination form, or download the form from the PATH Intl. corporate documents page. Nominations are due to the PATH Intl. office by July 15. If you prefer, you may print the nomination form, fill it in by hand and mail it to the PATH Intl. office. All handwritten nomination forms must be received in the office by July 15 in order for the nomination to be considered. If you have any questions please contact Kimberly Price, PATH Intl. Region Networking Coordinator. Thank you to those nominees who are willing to contribute their time in representing the PATH Intl. members in their regions. The 2016 PATH Intl. 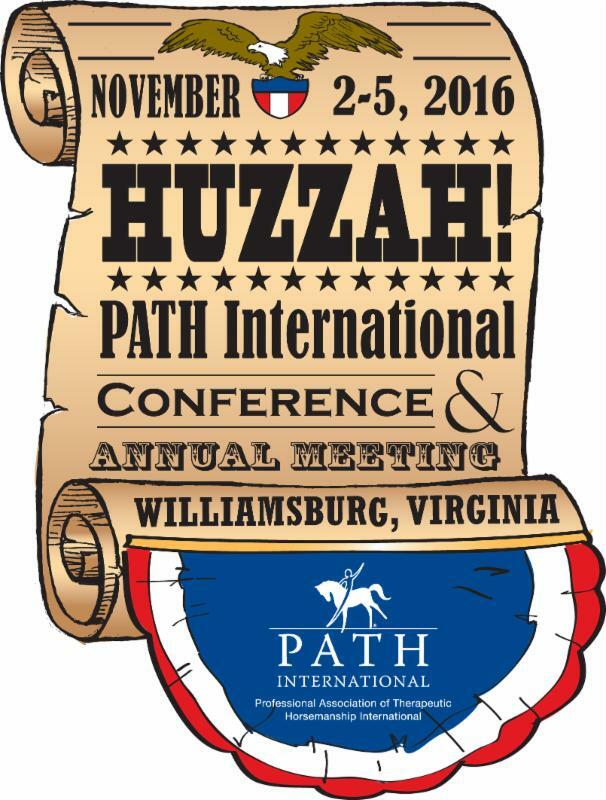 Conference and Annual Meeting, presented by title sponsor Purina, will be November 2-5 in Williamsburg, VA. Registration will open in July, and the registration book will be included with the summer issue of PATH Intl. Strides. New this year: Reserve a table of 10 at the 2016 PATH Intl. Awards Banquet, November 4, 2016, for $50 per table. This non-refundable fee will benefit the PATH Intl. Disaster Relief Fund, which has been seriously depleted due to the flooding this spring, but it will also create a better system for tracking and assigning tables. Please mark the table reservation on your online registration or on your registration form through October 10. (Don't forget to put the name(s) you would like on the table.) There will also be a signup sheet on site in Williamsburg at the registration desk through noon on Thursday, November 3. Phone confirmations will not be accepted. As we consider best practices for the equines who work in EAAT programs, it is crucial to not just care for the physical body of the horse but also acknowledge their mental and emotional state. When truly honoring the whole horse, we consider their mind, body and spirit. The mind and body are not separate entities but part of the same energetic system and directly affect each other. Read more. Loudoun Therapeutic Riding, a PATH Intl. Premier Accredited Center in Leesburg, VA, was featured in the June 7 edition of Sidelines News, in "Healing With Hooves." The article also spotlights Andy, one of the horses at LTR, who accepted the Klinger Prepetual Award for Honor & Service at the Washington International Horse Show. The award was created to honor Klinger, a horse who touched the lives of many in his life of service with the Third U.S. Infantry Regiment (The Old Guard) Caisson Platoon. Click here to read the story. GallopNYC in Brooklyn, NY, was recently featured in The New York Times. The article describes GallopNYC's mission, impact and expansion in Gemini Fields in Howard Beach, Queens. Click here to read the story. Enter the 2016 PATH Intl. Photo Contest and Win! Get your camera ready and enter the 2016 PATH Intl. photo contest. Gain greater exposure for your center while seeing your photos in PATH Intl. Strides, eNews, the website and a variety of other places! Winners will receive a free registration for the 2016 PATH Intl. Conference and Annual Meeting or other fabulous prizes. The deadline to submit photos is June 30, 2016. Set your digital camera or phone at its highest resolution and take your best active photos of your center's riders, equines, volunteers and professionals. Show us your center's driving, interactive vaulting, group activities, teamwork and more! Be creative; there is no limiting your inner photographer. Click here for specifications, submission guidelines and forms. PATH Intl. Member Caroline Martino is gathering information on horse retirement for a presentation she is putting together and would like your help. Click if you would like to participate in the survey "Retiring the EAAT Horse: Survey of PATH Intl. Centers' Challenges and Options." The survey closes July 22. Thank you for your time! PATH Intl. Media Partner Equine Network/Active Interest Media publication Stable Management, in conjunction with its partners Horse Health Products, Organized Barn & Trailer, and Forever Fork, are giving away $1,000 in product and equipment--and a membership to USRider roadside assistance--to a deserving PATH Intl. Member Center in the Stable Management Tack Room Makeover Contest. From now until July 15, 2016, nominate a PATH Intl. Member Center (one nomination per person). Click here to fill out your nomination form. The grand prize winner will be selected around July 25.